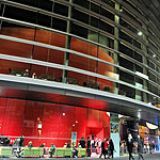 Curve is an ultra-modern theatre featuring two auditoria. It is home to a diverse range of performances including plays, dance, music and comedy. Do you work at Curve? Access for All Tourism Award 2013 at the Leicester and Leicestershire Excellence in Tourism Awards. What did you think of Curve? Given that it gets £800K local subsidy a year and is in a technically state of the art building with everything laid on, the quality of theatre here should be much much better than it is. It's basically a vanity project for PK, the artistic director, with a huge over-emphasis on undemanding musical theatre. I've possibly seen 30 shows here since it opened and three have been good, two of those touring shows. The visitor experience and welcome is dreadful. At long last they are starting to address the fact that clients want to eat before the show, but too little too late. The catering to date (Dec 2012) has been utterly inadequate. Be very careful of the gross parking charges in the NCP next door. You must go to the Curve Box Office to get a concession. Curve did undoubtedly have a shaky start but is now proving to be a massive success with many excellently received in-house productions along with some really good touring shows. Each time I have been recently to either auditorium they have been full which has to say something. There is a massive range on offer and certainly not just musicals though the latter really bring in the crowds and are an essential element to make the theatre sustainable in the long term. They do put bums on seats and people enjoy them which is much of what theatre is about isn't it? In-house productions of non-musicals have included superb versions of One Flew Over The Cuckoo's Nest and the Lieutenant of Inishmore to name but 2. The food offer was not good for a while but the addition of pre-show suppers on the architecturally unique and spectacular mezzanine are terrific in both quality and value - it may have taken a while to set up but it is certainly a great addition. 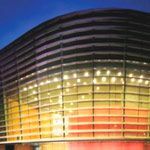 The cost of parking in Leicester is always dreadful but that is hardly the theatre's fault and they have negotiated a deal which reduces the charge by about 50% at the adjacent multi-storey. I have come to really appreciate the hard work being done at Curve and most every production I've been to. Hugely looking forward to Piaf and The Hired Man - yes both musicals but both with intelligence. Can't wait for the rumoured production of Richard iii which will certainly add to the excitement and buzz in Leicester following the discovery of his body. Overall I would say - great work Curve - you've turned it round against the odds and despite the moaners.